Sunday, 8 Jan – Well, after a socialable day yesterday, woke up feeling a bit flat today. Luckily, the family felt the same and suggested we go out for a posh sandwich and a wander around the old part of town nearby. Must say after the usual problems of parking (now can’t park on the single yellow line), we rebelliously parked out of town and walked in thus saving paying to park on a Sunday. Not surprised people shop online. Not for me though. Anyway, it was great to get out and about and chat with family and wander around the shops. Popped into a new pub/restaurant and had a quick drink too. Surprisingly, we’ve had a few new establishments arrive locally, which, as so many pubs are closing down, is encouraging. This evening I decided to finish up yesterday’s leftovers. 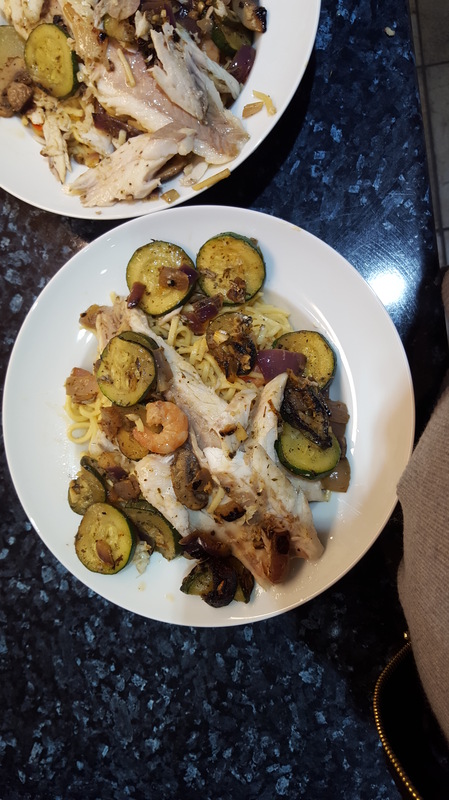 Bought some seabass so chopped up courgettes, mushrooms, onions and garlic. Also, added herbs, paprika, cream cheese and wine. 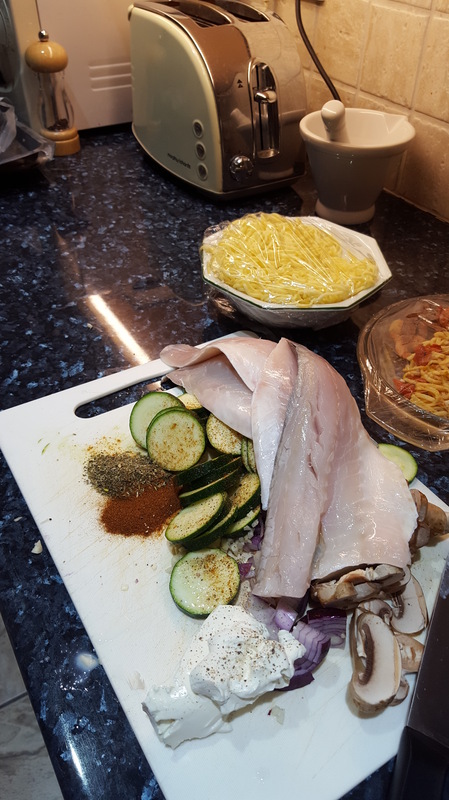 Cooked the fish and removed the skin, then cooked the veggie mix, added cheese and wine and after a few minutes threw in the spaghetti. Have to say, although it looks a mess, it was delicious and I’ve managed to get rid of a few leftovers. Called it board cooking because all the ingredients are prepared on a board and then tossed in a pan. Easy, quick and yummy.